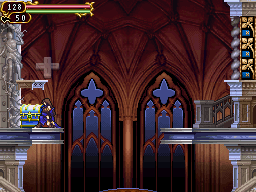 The game begins with Shanoa, the main heroine, entering into the building. There will be a scene with Albus. After the scene, continue up the platforms and head to the door at the right. Then watch the scene. You'll be in a room with Barlowe and a glyph. He'll teach you how to absorb glyphs and how to use them. hold the up button until you have absorbed the glyph, Confodere. Now head into the menu and go into glyphs section. Equip both and with the newly-acquired glyph and attack Barlowe a few times. Now he'll teach you about the Glyph Union. Hold up and press or to do a glyph union on Barlowe. After that, he'll then tell you to go right to fight some monsters. But first, head left. You'll see a jar go to it and hold down to recover your hearts you lost using the Glyph Union attacks. Now head right through the room and you'll fight some skeletons, nothing hard. After you kill them all head back to the previous room for a chest with a Record 5. Head right two times and talk to Barlowe. After the scene, head right. Now head right again. There is a statue there. This is a save point. Not only does it save your game, but if you are low in HP, it will heal both your HP and MP (Hearts are not restored). Press down to uncover a hidden chest. 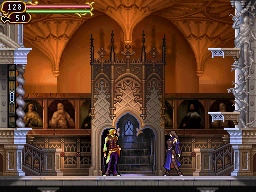 After completing the tutorials, head towards Barlowe's room, but do not enter it. Instead go left from it. go underneath the platform and press down. a chest will appear from ground. Open it for a Record 1. This is the last record that can be obtained from chests and the rest must be bought after completing some side quests. Now that we're done here for now. Go down to the bottom of the room and head left. Then head left again. You'll be in the travel map. The only place you can go is the Monastery. So head there. This page was last edited on 5 September 2015, at 05:21.